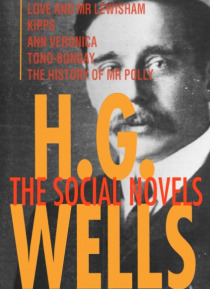 DISCOVER A DIFFERENT SIDE TO H. G. WELLS . . . H.G. Wells's social tales caused a sensation when they were first published in the early twentieth century. Piercingly funny, yet sympathetic, and containing a cast of colourful characters, they have drawn comparisons to the works of Dickens and Evelyn Waugh.From the hapless Kipps, who is plunged into a world of high society, the rules of which he fai… ls to understand, to Mr Polly, the draper, desperate to escape his shop and nagging wife, to Ann Veronica, a young woman rebelling against her father's stern patriarchal rule, these satires of Edwardian mores are both horribly funny and provoke questions about the class system and opportunities for social reform. The social novels include LOVE AND MR LEWISHAM (1900), KIPPS (1905), ANN VERONICA (1909), TONO-BUNGAY (1909) and THE HISTORY OF MR POLLY (1910).